Winx piloted by Hugh Bowman is eased up before the line in Saturday’s Cox Plate. The 2015 Cox Plate has been run and won with fourteen of the world’s premier 2000 meter horses assembling at Moonee Valley last Saturday afternoon. Unlike last year, when we saw Irish trained galloper ‘Adelaide’ storm to the front in the final stages of the race, it was an Australian-bred galloper in ‘Winx’ that claimed victory in Australasia’s weight-for-age championship. Whilst it was no great surprise that Winx handed champion trainer Chris Waller his first Cox Plate victory, it was the manner in how the Sydney trained mare did it that made everyone take notice last Saturday. With the field scattered with proven Group 1 horses such as Fawkner, Criterion and Happy Trails the average punter could have been confident in any runner they selected as their tip to win the race, however, it was the Waller trained mare that came out on top. In an interview post-race, winning jockey Hugh Bowman stated how the race had not necessarily gone to plan when Tasmanian galloper ‘The Cleaner’ rolled off the fence earlier than expected at the 600m mark of the race, forcing Bowman and his mount to show their hand early. It had no bearing on the result however, as Winx surged forward and placed a significant gap between herself and other rivals as they turned for home, turning Australia’s coveted 2040m Group 1 into a one horse race from the 200 meter mark onwards. 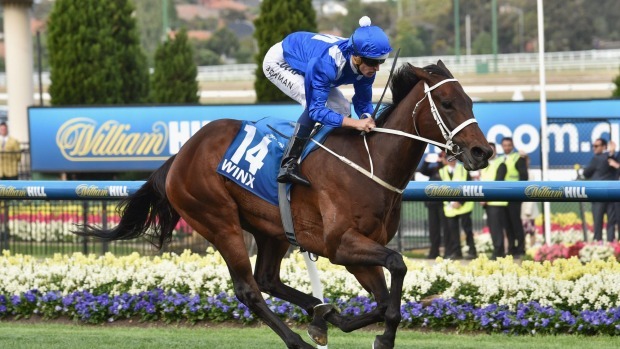 The race itself was over in record breaking time, with Winx clocking in at 2:02.98, beating the previous record of 2:03.54 set by champion Australian galloper ‘Might and Power’ in 1998. Whilst Winx streamed away at the front, the well supported ‘Criterion’ who despite being forced to change stride earlier on in the race managed to hold of the Aidan O’Brien trained ‘Highland Reel’ for second, with other runners such as Pornichet and Hartnell finishing bravely with the latter to target next week’s Emirates Melbourne Cup. Happy Trails drew a wide gate and was forced to come around the field as runners looked to straighten up, therefore effectively diminishing any chances the South Australian galloper had of making a bold showing. 2013 Caulfield Cup winner, Fawkner, was able to work his way into the race quite nicely after settling a long way back in the run due to a wide barrier, he will head to the Mackinnon Stakes this coming Saturday at Flemington. Another Waller trained runner, ‘Preferment’, who finished ninth in the fourteen horse field, will also line up in next Tuesday’s Melbourne Cup. Very good informative article. Has this journo been around for a while? Seems like a good breed to me. Thanks heaps! Just a start, more to come!